Todae, Sat.. Reached the shop at 11.17am.. 17mins late.. But hu cares.. Hahaz.. Cos i missed the bus, even if i work overtime aso no extra pay lo.. If she nt happy den fire mi lohz.. I'm tired anyway.. The time passed so sos so slowly todae.. ='( Sobz.. Next week's schedule is disappointing..
Should i quit again on Sat?? Wahaha.. Skip work..
Yest nv eat a thing at work.. Onli drinkl Ice Lemon Tea.. Hahaz.. Hope casn everydae like tt.. Work there, almost everydae gt free food lohz.. Got dumplings, dessert, old chang kee.. Wanna go on diet always difficult.. Hu ask my collegue is such a nice person.. hahaz..
Todae, a regular customer gave her a japanese cucumber.. Hahaz.. 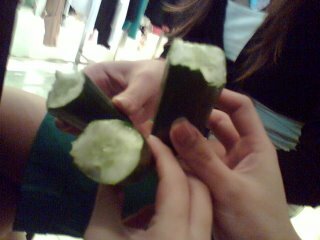 This morning, i ate noodles, evening ate the Old Chang Kee and abt 1/2 hr b4 the shop close, we ate the cucumber.. Wahaha.. Healthy diet lohz..
After tt, we treat the passer-by of the shop like nobody.. Ans we started cam-whoring.. hehez..
Dunno y my stupid phone cant receive photos from blue tooth.. Haiz.. Pr else can haf nicer pics le.. Hehez.. Both gers gt N70.. Haiz.. Like v nice leh... Hope i can change mine too.. Hehez.. Went to bugis on Thur.. Hahaz.. 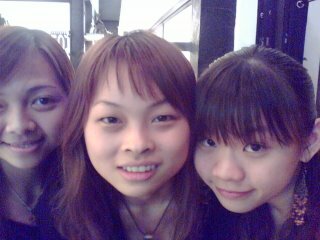 Wanted to eat Fish & co. de, haiz, hu noes, it close le.. Bahz.. 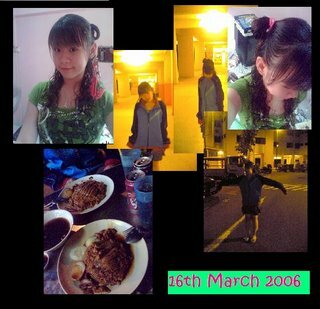 So we crossed the road to eat the yummy Yu Kee (i tik so) Duck Rice.. hehez.. Nice, cheap and full..
Hahaz.. Dunno y i so crazy.. wear tt jacket and took dumb pics.. Saw the road no cars, so bo liao loh.. Hehez.. Tomorrow might nt be better, but a better tml will definitely cm one dae..